Home What Is a Malaligned Socket? Cup malposition can be a contributing factor to prosthetic impingement and dislocation after total hip arthroplasty (THA). However, the ideal cup position, or “safe zone,” is difficult to define for several reasons. When supine X-rays are used, cup abduction and anteversion are measured relative to the plane of the X-ray table. During computer navigation, the anterior pelvic plane is generally used as a reference. However, the position of the pelvis typically moves when the patient goes from supine to sitting to standing. In addition, the amount of pelvic movement between individuals can be quite variable. Range of motion to impingement also depends on femoral component anteversion, so the ideal cup position, or safe zone, is influenced by the orientation of the femoral component. Lewinnek et al described a safe zone of 40 +/- 10° of cup abduction ad 15 +/- 10° of anteversion. Although it is appealing to define a target position or safe zone outside of which the cup is “malpositioned,” many factors other than orientation of the acetabular cup can affect the range of motion to impingement. The position of the acetabular component can be described quantitatively by its radiographic inclination seen on a supine anteroposterior (AP) radiograph and its anteversion seen on a cross table lateral view. The angles measured on these two views are relative to the plane of the X-ray table (Figure 1). Figure 1a. AP radiograph which appears to show adequate cup position. Figure 1b. Cross table lateral radiograph demonstrates retroversion of the acetabular component. A frog lateral view is useful to assess femoral component position, but because the pelvis is visualized in the AP projection, cup anteversion cannot be assessed on this view (Figure 2). Figure 2. An AP pelvis radiograph (right) and frog lateral view (left), both show the same orientation of the acetabular component. The abduction angle for the acetabular component relative to a transverse line along the teardrops (orange lines) is identical in the two views. Alternatively, the frontal plane of the pelvis (plane formed by the anterior superior iliac spines and pubic symphysis) can be used as a reference for acetabular component orientation. This plane is typically used for computer navigation by identifying the two anterior superior iliac spines and pubic symphysis during surgery or with CT scanning. There are usually slight differences between the two reference planes due to variations in lumbar lordosis. Is There a Safe Zone for Dislocation? Historically, components positioned outside the safe zone defined by Lewinek et al in 1978  have been considered malpositioned. 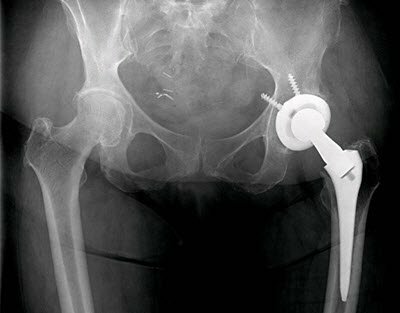 However, the Lewinek study was based on a retrospective review of only 9 dislocations in 300 total hip arthroplasties, including revision cases. Although this study has been an important contribution to the othopaedic literature, it does not describe factors other than radiographic cup position that can contribute to impingement and dislocation, such as femoral anteversion and changes in pelvic orientation with supine, standing, and sitting positions. Because range of motion to impingement is affected not only by cup position, but also by femoral component position and pelvic or spinal mobility during activity, the same acetabular component position may not be ideal for all patients. If recurrent instability develops after THA and revision to improve acetabular component position results in restoration of hip stability, then the original acetabular component would be considered malpositioned because its orientation was the primary etiologic factor leading to dislocation . Is There a Safe Zone for Wear and Impingement? Impingement may occur without dislocation, which can lead to wear and mechanical damage of the acetabular rim. Impingement damage has been reported in 39% of retrieved conventional UHMWPE liners. Hard-on-hard bearings and highly cross-linked UHMWPE are less tolerant of impingement damage than conventional UHMWPE. Impingement of ceramic-on-ceramic bearings can cause chipping of the liner. Patients who receive a hard-on-hard bearing surface should be counseled about the potential adverse effects on bearing performance related to impingement and edge loading and the variability that can be expected with component positioning using current techniques. Occasional highly cross-linked UHMWPE liner fractures have occurred in vivo, which have been associated with component malposition, thin UHMWPE, and poor implant design. However, with current modular acetabular components, highly cross-linked UHMWPE appears more tolerant to impingement and edge loading than either metal-on-metal or ceramic-on-ceramic bearings. How Do You Position the Cup? Most patients are placed in the lateral decubitis position with a pegboard or beanbag for THA. However, there may be considerable movement of the pelvis during surgery, which can affect the apparent cup position. For a posterior approach, the femur is retracted anteriorly during acetabular exposure, which can cause the pelvis to tilt forward. The surgeon can compensate for this by increasing the forward flexion of the mechanical guide to achieve adequate anteversion. Similarly the mechanical guide is tilted into greater abduction to avoid vertical cup placement (Figure 3). Figure 3. 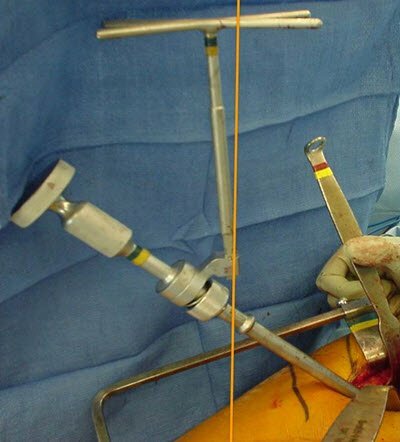 An intraoperative view of a mechanical guide attached to the handle of the acteabular insertion rod at 45° is abducted slightly relative to vertical (orange line). This provides more reliable abduction at 45° or less and avoids vertical cup positioning. Anatomic landmarks can also be used to assist in cup positioning. The inferior edge of the cup should be parallel to the transverse acetabular ligament. Because the inclination of the normal acetabulum is more vertical than the desired cup position, the superior lateral edge of the cup is typically uncovered by bone. However, the superior coverage is quite variable and also affected by the amount of cup medialization and acetabular dysplasia. Navigation has been shown to reduce the amount of outliers, but also increases cost and surgical time. Despite our best efforts to position the cup properly, the final implant position can be quite variable among surgeons and in any individual surgeon’s practice. This is most likely due to variations in spinal and pelvic mobility among patients, pelvic movements during surgery, and variability in the accuracy of methods used to position the cup. When Do You Get an X-ray? An intraoperative x-ray is an effective method to check cup position. If the patient is in the lateral decubutis position, the X-ray is taken as a cross-table lateral. This view can be misleading if the pelvis is tilted and the X-ray beam is not perpendicular to the pelvis. A more reliable view is a supine radiograph. However, this view requires that the patient be repositioned supine after the wound is closed. If there is any concern about implant position, I routinely obtain a portable supine AP pelvic radiograph while the patient is still under anesthesia and before leaving the operating room. Although this increases OR time, it provides an opportunity to reopen the wound and correct any component malposition, if necessary. Otherwise a postoperative X-ray can be obtained in the recovery room to check for dislocation and assess final implant position. Michael D. Ries, MD, is from the Tahoe Fracture and Orthopedic Medical Clinic in Reno, Nevada. 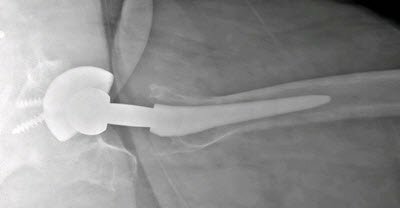 Lewinnek GE, Lewis JL, Compere CL, Zimmerman JR. Dislocations after total hip-replacement arthroplasties. J Bone Joint Surg Am, 1978 Mar;60(2):217-220. Taki N, Mitsugi N, Mochidia Y, Akamatsu Y, Saito T. Changes in pelvic tilt angle 2 to 4 years after total hi arthroplasty. J Arhrtoplasty, 27: 940 – 944, 2012. 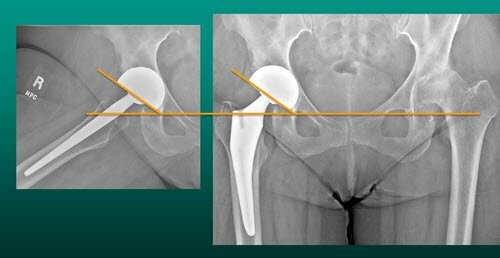 Miki H, Kyo T, Sugano N. Anatomic hip range of motion after implantation during total hip arthroplasty with a large change in pelvic inclination. J Arthroplasty, 27: 1642 – 1650e1, 2012. Amuwa C, Dorr LD. The Combined Anteversion Technique for Acetabular Component Anteversion. J Arthroplasty, 23: 1068 – 1070, 2008. Saadat E, Diekmann G, Takemoto SD, Ries MD. Is an Algorithmic Approach to the Treatment of Recurrent Dislocation After THA Effective? Clin Orthop Rel Res, 470, 482 – 489, 2012. Yamaguchi M, Akisue T, Bauer TW, Hashimoto Y. The spatial location of impingement in total hip arthroplasty. J Arthroplasty, 15: 305 – 313, 2000. Liu F, Gross TP. A safe zone for acetabular component position in metal-on-metal resurfacing arthroplasty. J Arthroplasty, 28: 1224 – 1230, 2013. Previous articleDoes Pathologic Evaluation of Tissue after Knee Arthroscopy Have Clinical Value?